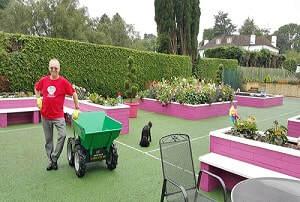 The electric muck truck power barrow is an innovative wheelbarrow designed for working indoors and outdoors. 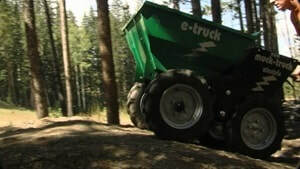 The muck truck electric power barrow has the same strong, unique features of our other muck truck power barrows with the added capability of working in areas that won't tolerate noise and fumes, making it kinder to the environment. 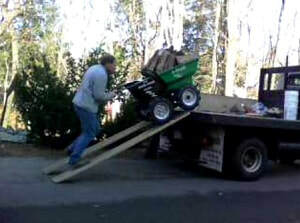 The 4 x 12-volt batteries create a power output of 24 volts to the transmission which makes this electric muck truck comparable to an engine powered wheelbarrow, when it comes to climbing and carrying heavy loads. The electric power barrow's full battery charge will last for 3.5 hours when run continuously, giving you plenty of time for completing any workload. Our electric wheelbarrow has been manufactured with the same existing standards and solid steel components as our other wheelbarrow models from the muck truck range. Load capacity: 550 lbs/250 Kg. Noise rating: less than 5db. Dimensions: L165 cm/ 65" x W71 cm/28" x H92 cm/36"
Transmission: Benevelli (24 volt) 2 forward and 2 reverse. Speeds: 0 -3.5 mph variable.